Shop French Knot Angel Christmas Ornaments exclusively at the NY NOW Summer event! NEW! Many customers have adored our candlestick hat displays, so this year we're sharing them with you. Available in small, medium and large, these hand-carved candlesticks make displaying your hats beautiful and simple. Disassemble at the base and top for easy packing and traveling. Ready-to-ship! Can be purchased individually or just $55 when you buy all three. We're offering deep discounts on our overstock items at the NY Now show. Place an order at the NY Now show for more than $1000 to SAVE 5% on your order. 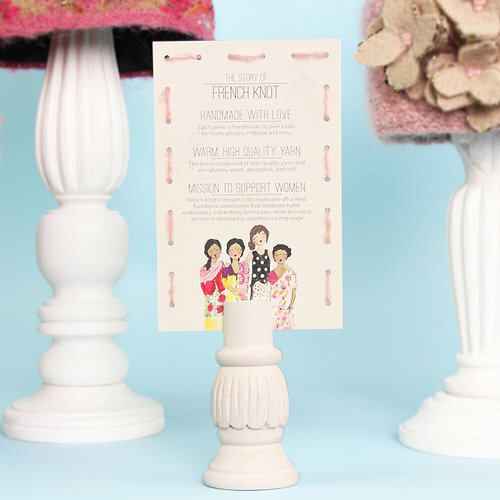 Plus, we'll throw in a FREE brand card that tells the French Knot story and is displayed in a hand-carved holder to help merchandise your French Knot collection. while providing artisans in developing countries with a living wage. Lafayette, Indiana – May 1, 2018 – In an industry overflowing with fast fashion, French Knot is an independent designer who thrives on developing stylish cold weather accessories that emphasize both lasting quality and social responsibility. A woman-owned textile company, French Knot collaborates with over 1000 Nepalese fair-trade artisans who spin, dye, knit, and felt French Knot accessories using skills entrusted by generations and guided by sustainable practices. Some women knit from their homes while they care for their families, while others prefer to work together in knitting circles. But, all are paid a living wage for their craftsmanship. Fast fashion means cutting corners in garment quality and treatment of the workers who make it. Consuming clothing designed to be replaced quickly usually means that garments are discarded to landfills rather than worn season after season or passed along to second-hand shops. French Knot winter accessories are made to last. They source high-quality natural wools using time-honored craftsmanship that produces little to no emissions. The combination of French Knot’s stylish designs and unique artistry that embraces detailed hand-embroidery, embellishments and beading makes their winter accessories unlike any other found in today's market. French Knot winter accessories and gifts can be found at retailers such as Sundance Catalog, Soft Surroundings, plus hundreds of museums and boutiques across the US and Canada. Established in 2012 by designer Lindsay Mason, French Knot (named after Mason’s favorite embroidery stitch) is a cold weather fashion accessories company that boasts whimsical styles, bright colors and lavish embroidery. Products range from hats, head bands, hand warmers, and mittens, to specialty gift items like hand-felted dolls, ornaments, stockings and tree toppers. French Knot’s mission is to create one-of-kind, functional accessories that celebrate hand embroidery and knitting techniques while providing artisans in developing countries a living wage. The French Knot collection is currently created by more than 1000 fair trade artisans in Nepal and Peru. Stay warm on the ski slopes or add a chic accessory for heading downtown. The Vintage Chalet is a colorful mix of pattern and embroidery with a delicate mohair. This winter hat is one of our most popular. Unique and coloful vintage-inspired knit winter accessories, hats, gloves, mittens, handwarmers, headbands, and gifts. This beautiful Felt Flower headband was inspired by our popular Felt Flower hat. Embellised with hand-felted flowers and delicate beaded detail. 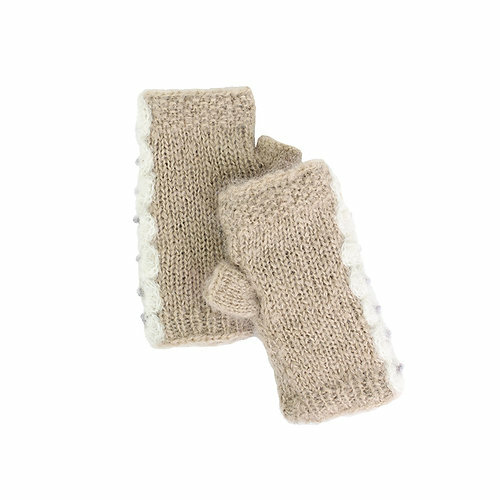 The Rita Convertible mitten is warm and cozy featuring a playful mix of patterns. Slits in thumb included for easy thumb access. Unique and coloful vintage-inspired knit winter accessories, hats, gloves, mittens, handwarmers, headbands, and gifts. Aptly named, this handwarmer accentuates one of our favorite embroidery stitches, the French Knot. The grid of contrasting French Knots adds texture and dimension that is fun yet soft. The Lorelai hat is one of our most popular designs. We can't decide which detail we love most - the mix of vintage patterns or the hand-emboidered flower and beading along the brim. Unique and coloful vintage-inspired knit winter accessories, hats, gloves, mittens, handwarmers, headbands, and gifts. Inspired by the 1920's cloche shape, the Abbey Cloche Earflap winter hat elegantly ties together the shape with tassle ties, crochet edges, and beaded detailing. Multiple earthy patterns and colors, along with detailed hand-beading and embroidery makes the Cozy Ethnic winter hat very unique. Unique and coloful vintage-inspired knit winter accessories, hats, gloves, mittens, handwarmers, headbands, and gifts. 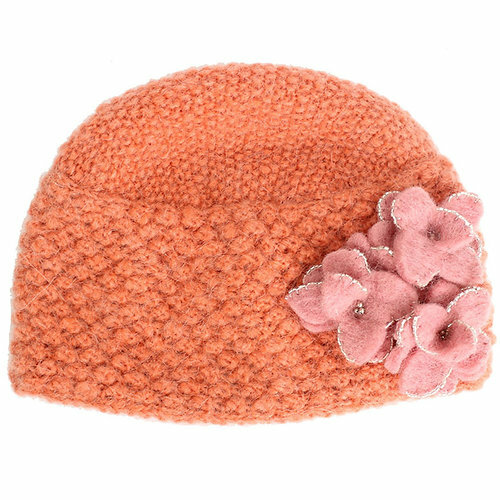 The Chunky Hat, of course, is a chunky gauge hand-knit hat with pop of color in the pom pom. The Gwen Handwarmer design is inspired by wildflowers growing by the shore and reflecting in the water and features intricate hand-embroidered details and beading. Unique and coloful vintage-inspired knit winter accessories, hats, gloves, mittens, handwarmers, headbands, and gifts. French Knot Tree Toppers, Stockings, Dolls, etc. 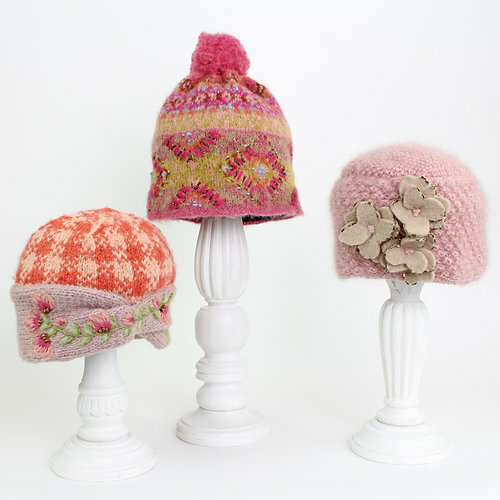 Each felted holiday gift item is handmade by female artisans in Nepal. Their hand-knitting techniques and detailed hand-embroidery are rarely found in today's market. French Knot accessories showcase beautiful hand-felting with ornamental detailing and hand-embroidery throughout. Our Christmas stockings are beautiful and unique with colorful details. 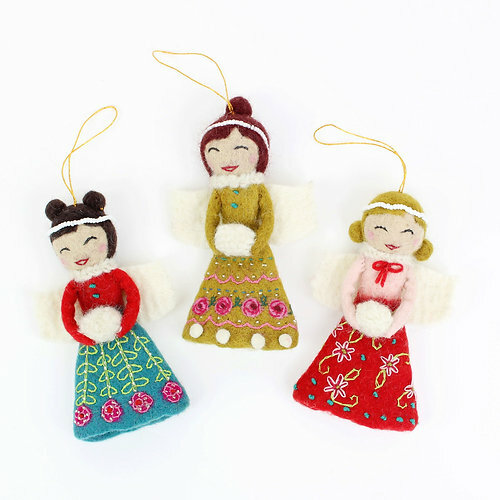 French Knot angel tree toppers are popular year after year and come with its own gift box. Each French Knot doll comes with a special story too. French Knot girl ornaments make great stocking stuffers. Unique and coloful vintage-inspired knit winter accessories, hats, gloves, mittens, handwarmers, headbands, and gifts.